Illusia is a casual, action, platform RPG game created by Gamevil. You control either a Fighter or a Magician as you travel across the land of Aztaran, helping those in need and stopping the evil that’s plagued it. Your character starts off by taking the Annual Graduation Exam for Warriors and Magicians, having failed several times before, they are determined to go all out and pass. You are given a set of quests you need to complete in order to pass and these can vary from killing small animals such as racoons to heavyweights such as the kangaroos and Gorilla’s but as you progress through the story, much higher level monsters will obstruct your path. Character select screen. You get to choose between either a Fighter or a Magician. While taking the exam you find out that your fellow examinees have gone missing and this is due to the tree spirit that resides in the forest. You rescue you’re colleagues and defeat the tree spirit but it claims that it was not itself and that it was hearing a voice. After receiving clearance and a pass certificate from the village chief, you find out the same kind of problems are happening all over Aztaran. You leave the village and travel across the land, ridding the evil wherever it can be found and getting to the bottom behind the mystery of the voice. 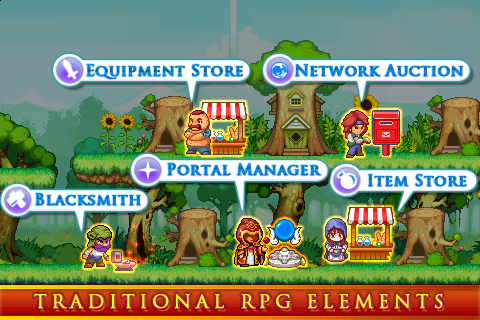 The game seems to use an old but trusted RPG formula here; as you defeat monsters you gain exp to level up your stats. This seems to be a working and trusted formula that’s implemented well in the game as it gives a sense of accomplishment and replay ability. The basic people and aspects of the village that you will encounter throughout the game. With its pixel graphics, Illusia portrays a cute and charismatic style with interestingly designed monsters, smoothly animated sprites and special effects that keep it visually fascinating. The classes are gender set, which could appeal as a limitation to character customisation; however the player can equip its character with items such as amours and swords for a better attack and defence. These items can be looted from monsters or bought from the equipment store. One thing that brings Illusia down are its awkward touch controls that prove too difficult to use in the heat of a battle, also the touch buttons to quickly assign skills are too small and you can sometimes find yourself performing the wrong move and using up that precious magic power. Illusia is a fine tuned RPG that is brought down due to really wacky controls, however if you can look past the odd buttons and jump mechanics, Illusia proves to deliver a solid gameplay experience which surpasses most games in its genre. Review by Zeiniex and Liban ali.